“New Haven’s Workers: An Elm City Story” is presented by the Greater New Haven Labor History Association. Since its opening in 2006, this traveling exhibit has been displayed at 12 locations locally and throughout the state. It paints a vivid portrait of the lives, victories, struggles and sacrifices of a courageous group of working people in the clothing industry in New Haven. Southern Connecticut State University's annual Women's Conference, April 20-21, 2012. Please contact GNHLHA Director/Archivist Joan Cavanagh at info@laborhistory.org for further viewing information. In 1932 and 1933, to combat sweatshop conditions in the clothing industry, workers from the Amalgamated Clothing Workers of America and the International Ladies Garment Workers Union cooperated in an organizing campaign. Their efforts resulted in large-scale unionization of the industry and improvement in wages, working conditions, and hours. Their history offers important lessons for all of us in these times. Did someone in your family work in the garment industry in CT? The exhibit has impacted thousands of viewers across the state! Many times we have heard comments such as "my mom worked in the garment factories." We have even heard from family members of those featured on the exhibit panels. CT's garment industry history is our collective history. We welcome you to share your family's stories through our History Among Us program or by contacting us at info@laborhistory.org. We'd love to hear from you! 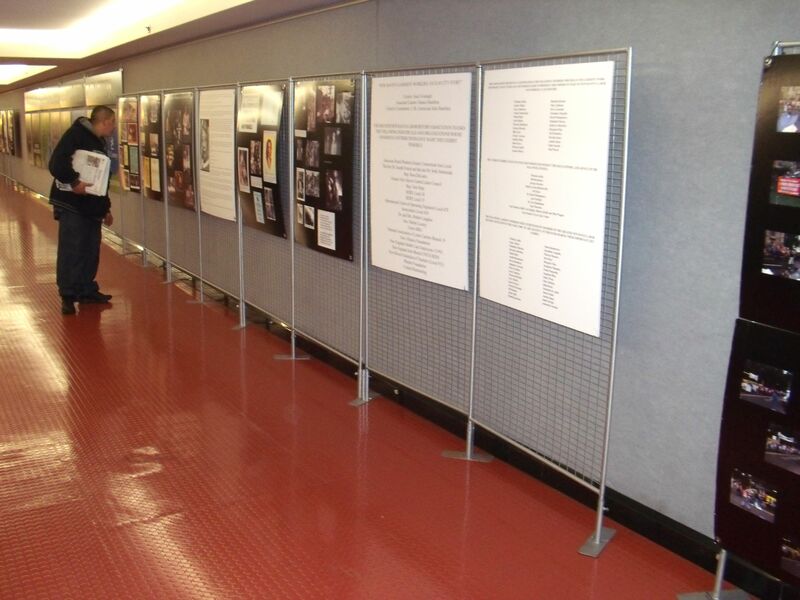 The exhibit's latest residence happily coincided with the public hearing before the Education Committee of the State Legislature about GNHLHA's raised bill to mandate the teaching of labor history, the collective bargaining process and the history of existing legal protections in the workplace as part of the Connecticut public school curriculum. Click here to learn more about the Labor History in the Schools Initiative.